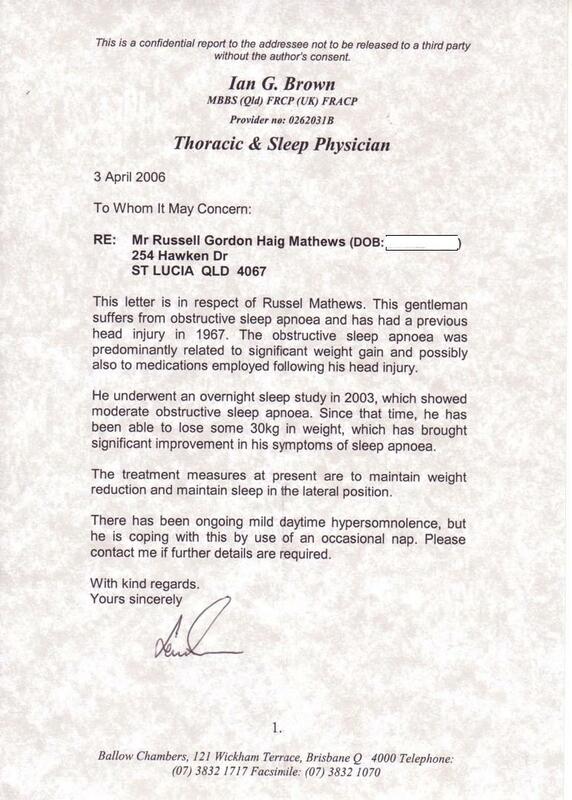 Fraud, Thief, Hugh McVean Voids the Special Fiduciary Duty he Owed to Russell Mathews. b. Is failing to agree to transfer the property to you for an agreed amount in terms of the Trust initially created when the property was acquired.
' The issue of Unconscionable Conduct . 'Based on that report and the various comments and diagnosis that Dr. Hazell makes about your condition, it would be clear to say that the persons dealing with you require to be careful in their conduct towards you and not to take advantage of you. 'In that light particularly Mr & Mrs McVean being members of the family and knowing your history, [ see admission by Hugh McVean below], would clearly be said to be in a trusting position in respect of your affairs and the Hawken Drive property. 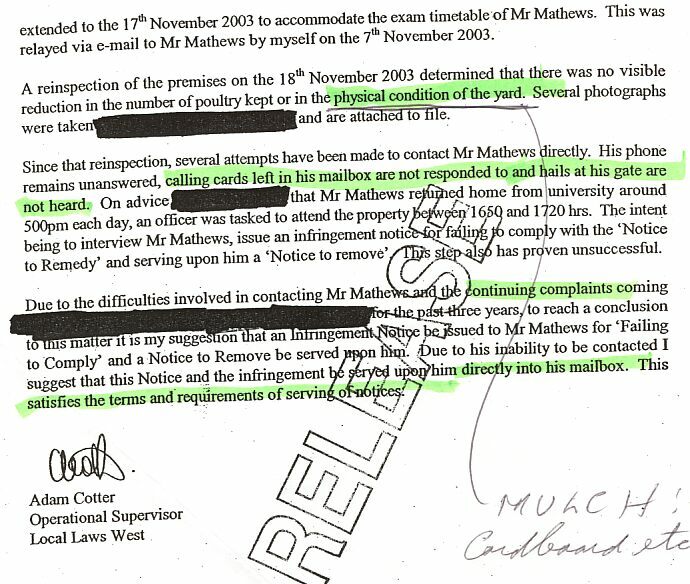 'Your medical condition therefore would clearly impose a special duty on Mr & Mrs McVean in the manner that they treat you and the arrangements with which they had entered into with you in respect of the Hawken Drive property. As one trained to be a lawyer, I can advise that that this "Special Duty" would in fact be a FIDUCIARY DUTY. Importantly, a Fiduciary cannot make a gain or profit at the expense of his beneficiary. In any disagreement or conflict between a Fiduciary and his Beneficiary, the Onus of Proof that the Fiduciary has acted properly towards his beneficiary, is fully upon the fiduciary. An interesting intellectual extension to this topic, is the situation of where a solicitor, who already owes each of his clients a fiduciary duty even when they are not disabled or suffering 'medical conditions' that imposes a Special Duty, to not take advantage of them, becomes aware that his client fits within this class, of being the beneficiary of this "imposed Special Duty". Well, as you may expect, the solicitor is likely to 'freak out'. See how this solicitor reacted. As stated above, this solicitor did state: "I have had the benefit of reading through the report of Dr. Brian Hazell which you have emailed to me and for which I thank you." Once again it is because of the comments and diagnosis of Dr. Hazell in his report I acknowledge that I have a special obligation to ensure that you are not lead into unnecessary and frivolous litigation. It is for that reason that I have had a looked at the issues you have raised in a sober manner and until such time as we reach agreement as referred to above by Client Agreements I am hesitant to simply provide to you indiscriminate advices as to your rights and remedies. It is obviously of some concern for me that at a later stage in our association that you do not raise a claim against me for either breaches of the Client Agreement or other obligations that I have to you. It is for that reason to ensure that there is no misunderstanding between us that I would prefer that communication between us in most parts be via email and that my secretary is present in any personal attendances taking on instructions from you." This solicitor's concern for email communications and his secretary witnessing discussions, was his realization that the onus would be upon him to show he had acted properly. 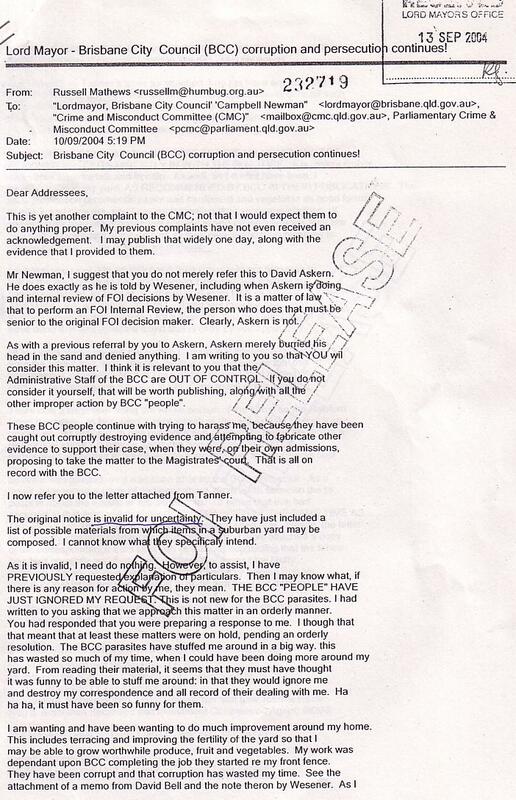 The following letter/email written by Hugh McVean and provided to me form the records of Brisbane City Council by Freedom of Information, [FOI[ [so there can be no doubt of its veracity], discloses a number of breaches of Hugh McVean's FIDUCIARY DUTY towards me. Clearly, Hugh McVean at all times, set out to take advantage of my disability. Calling me a TENANT. A beneficiary cannot be a simple Tenant of his trustee. [Hugh McVean thought he could use the legal system to defraud me, and so far, the corrupt legal system has permitted him to do that and caused me so much other greater loss. Hugh McVean waited 'til my father died in August, 2003, [and my sister Coral McVean assisted Hugh McVean to defraud me of my home], before he believed he could complete his fraud of me. 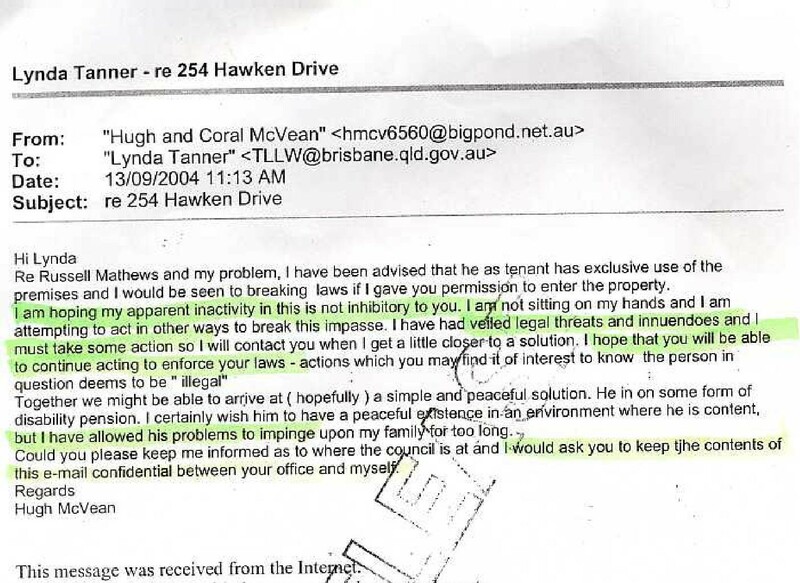 Hugh McVean's encouragement of the Brisbane City Council to act against me. [Do you like his turn of phrase'': he thinks he is writing in legalese''- he wishes: "Ï am hoping that my apparent inactivity is not inhibitory to you." 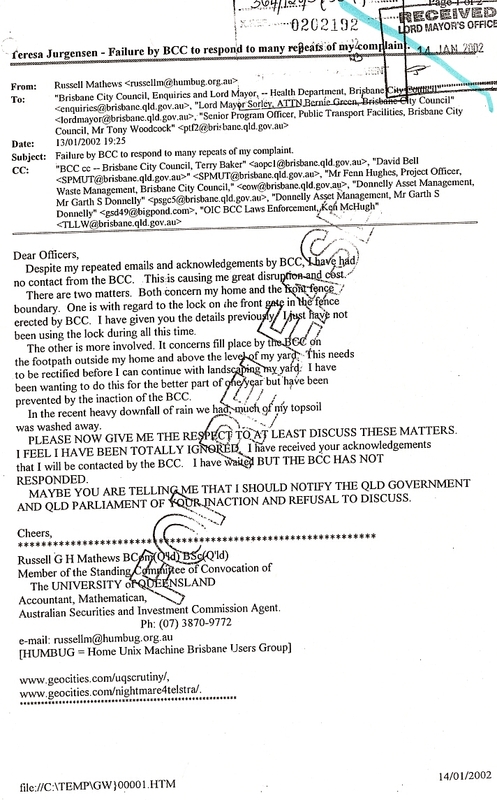 and "I hope you will be able to continue acting to enforce your laws .."
He indicates he is conspiring with the Brisbane City Council, "... so I will contact you when I get a little closer to a solution." and "Together we might be able to arrive at ( hopefully ) a simple and peaceful solution." "It is not our desire to make you homeless nor to discriminate against you even though you are convinced of both of those beliefs. Of course we know that you are disabled and we know the history of your accidents/attacks to be not of your making. Why do you think we will continue to provide a tenancy for you ( with due concern for our continued return on our investment ) along with the fact that you are Coral's brother?" 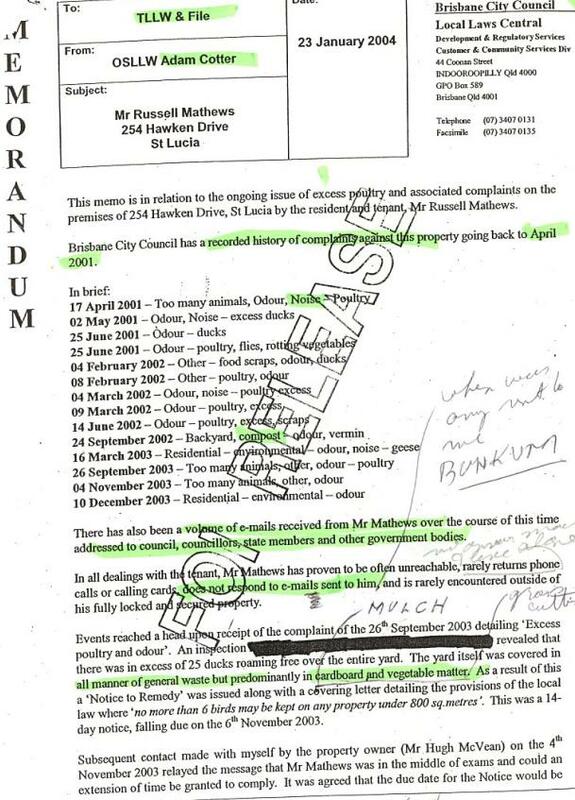 You will notice also in the final brackets that Hugh McVean was sending a copy of this email to Judy Magub, The Brisbane City Councillor for the area of Brisbane in which my home, BENEFICIALLY OWNED BY ME, was situated. Judy Magub acted improperly, so we had her sacked. 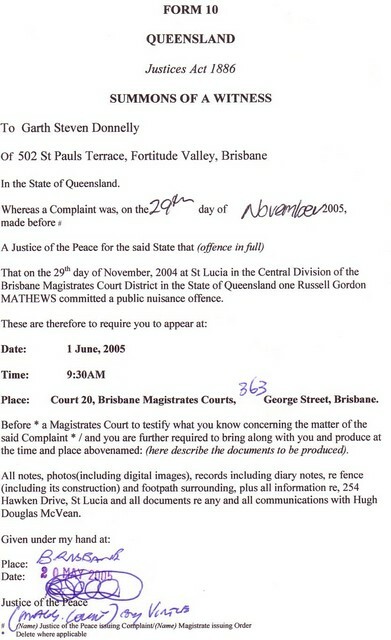 IMPORTANTLY, this was COMPLETE LEGAL NOTICE, to Judy Magub and to the Brisbane City Council, [although we do not suggest that this was the intention or desire of the fraudulent Hugh McVean], of my disability and the way that they should deal with me, as per the Legal principle stated above in the Lawyers communique. 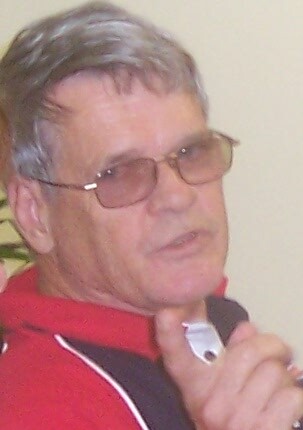 In fact, there were many instances of NOTICE of my disability to the Brisbane City Council, and the way they should have acted towards me, but instead, they decided they could use my disability, & the WIDESPREAD ENDEMIC CORRUPTION in Queensland, to take advantage of me, & ASSIST HUGH McVEAN TO DEFRAUD ME. Despite what Hugh McVean wrote in the email of copy of which was sent to Judy Magub, Hugh McVean would say to me, "You're not disabled. You have four Uni degrees." He would, in emails, even ridicule that I was disabled, as in the image of part of an email immediately below. Here, Hugh McVean is ridiculing me and my statememts that I am disabled and that that makes me impoversihed. The reader must realize that Hugh McVean writes for the audience he is addressing. 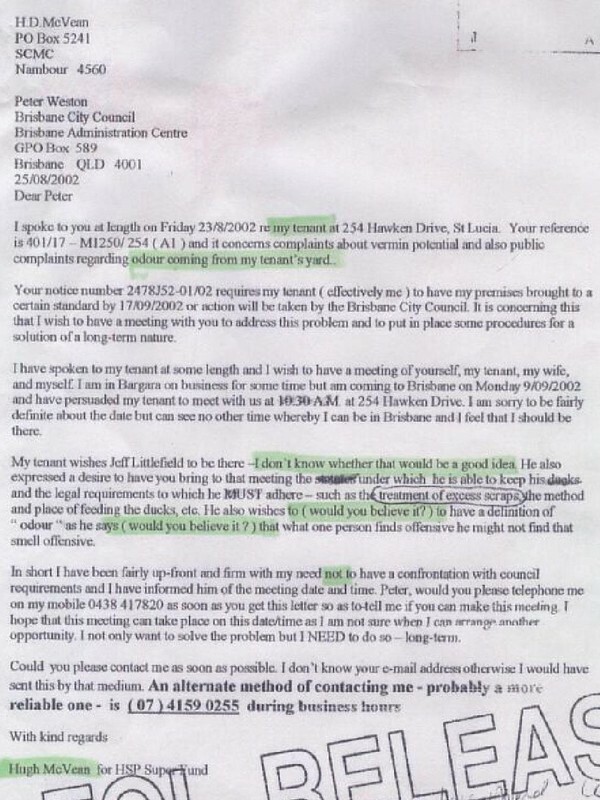 His intention in the email also sent to Judy Magub, was to show Judy Magub that he is a 'really caring person', and to appear to me that his is at a distance to the Brisbane City Council. "My tenant [that is I, Russell Mathews - so a breach of Hugh McVean's Fiduciary Duty right away], ... also wishes to ( would you believe it? ) to have a definition of "odour" as he says ( would you believe it? ) that what one person finds offensive he might not find that smell offensive." This further documentary evidence of the manner of how Hugh McVean communicates. He is constantly monitoring the feedback of how he and his story is being received. 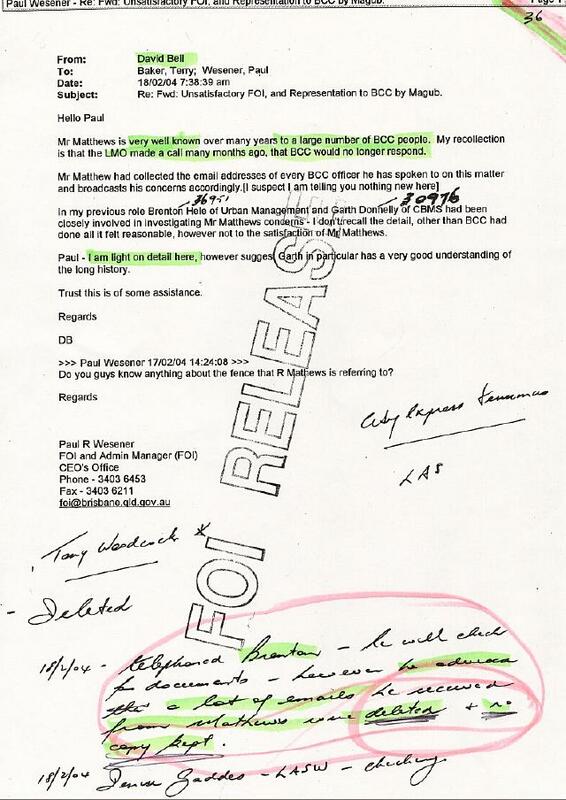 Hence, he is not interested in "leaving a message"as shown by the comment of the Emma Kearney who took the phone call. She states, "..could not squeeze any further info from him." 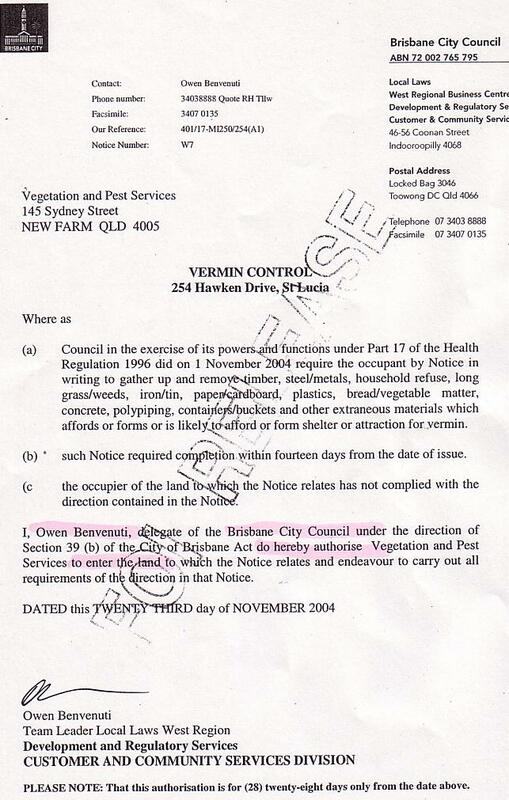 The approach of Hugh McVean was to ridicule and denegrate me to appear to the Brisbane City Council employees as being overly helpful [See note at the bottom, by Peter Weston. ], and to also denigrate and ridicule me so that they too would follow suit and treat me with disdain. Of course, that is totally abrogating his mandatory Fiduciary Duty to me as Indicated in the Lawyer's advice above. 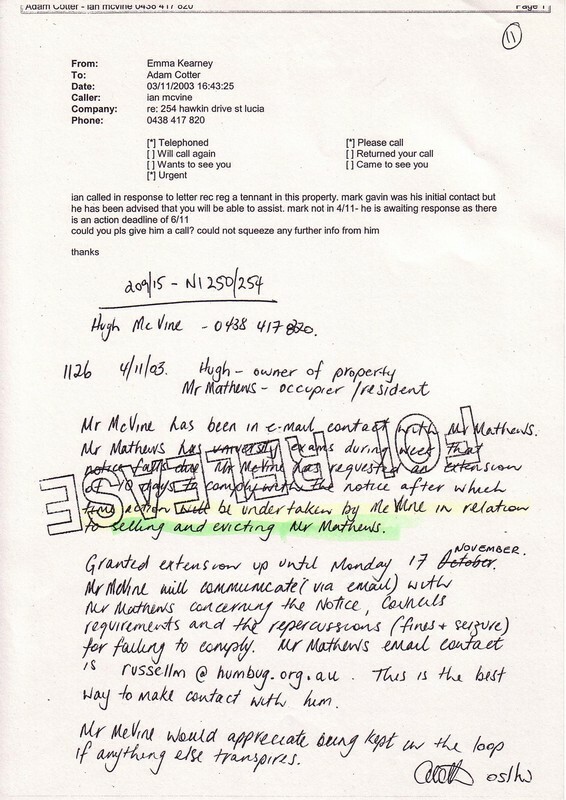 He had done this in about March 2000, when Garth Donnelly of the Brisbane City Council 'phoned Hugh McVean as Hugh McVean's name and phone number is on the rate notice as he had legal title of the property in Trust for me, the beneficial owner, [and I still am the beneficial owner]. 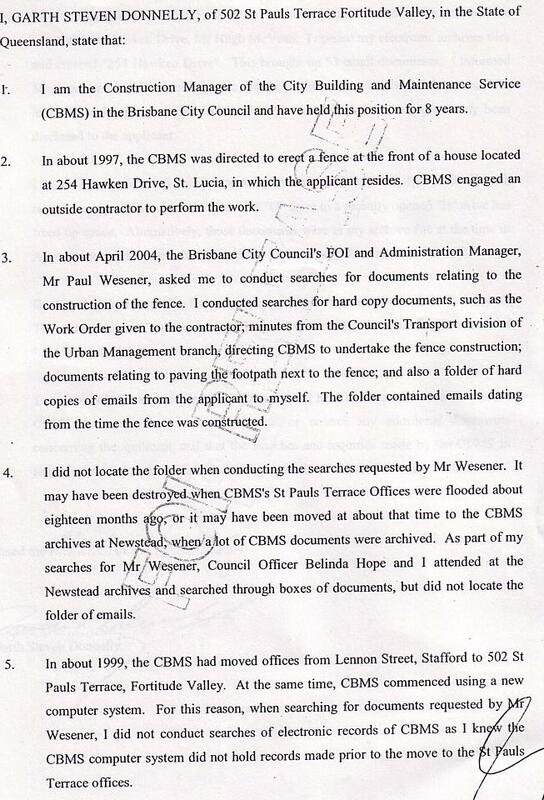 I had managed to have the Brisbane City Council build a 6 foot high fence on the two street boundary of my property at 254 Hawken Drive, St Lucia. Hugh McVean cannot help himself. 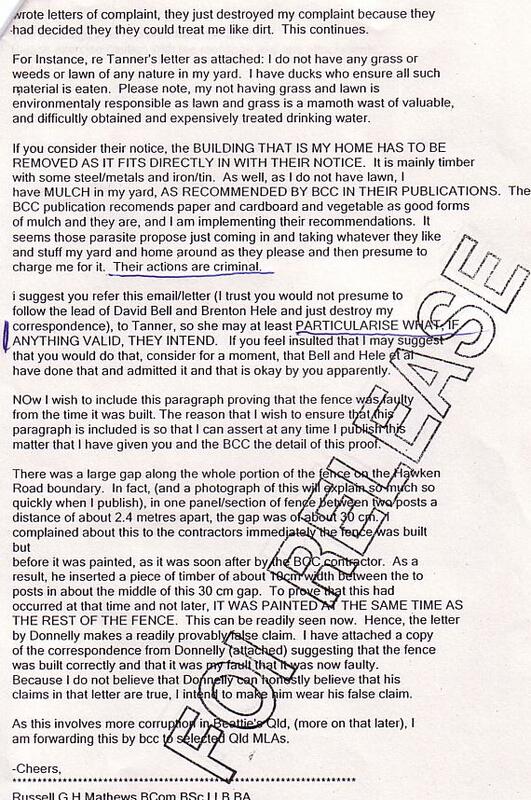 I had already had some dealings with Garth Donnelly as he was the BCC building supervisor of the fence building contract. 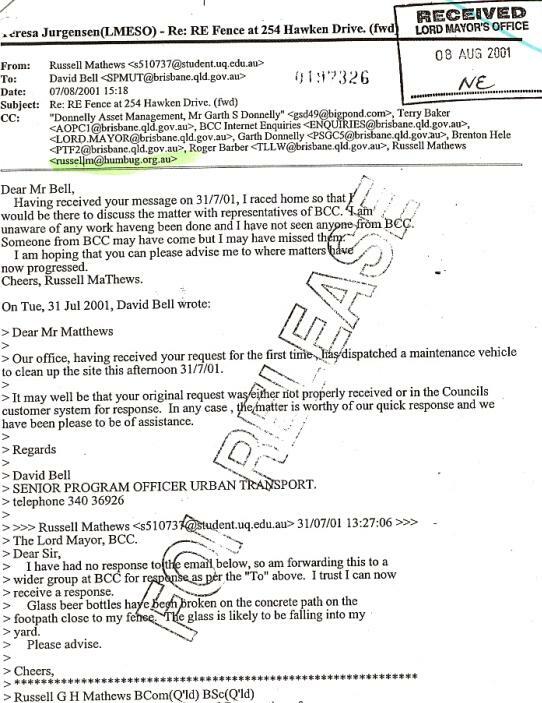 Hugh had to denigrate me so I was treated with disdain by Garth Donnelly and his fellow employees of the BCC, such that they sabotaged the building of the fence and then destroyed my emails when I tried to have them fix it. 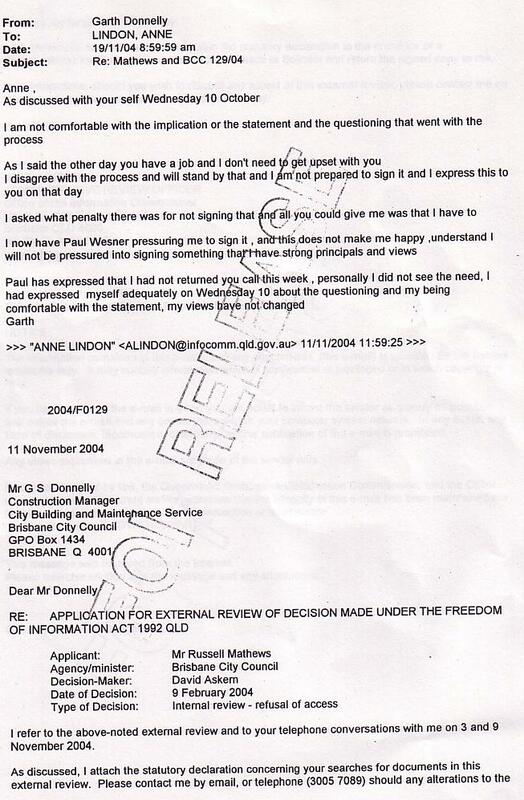 That initiated a series of events where Garth Donnelly deliberately withheld emails that I requested under FOI. 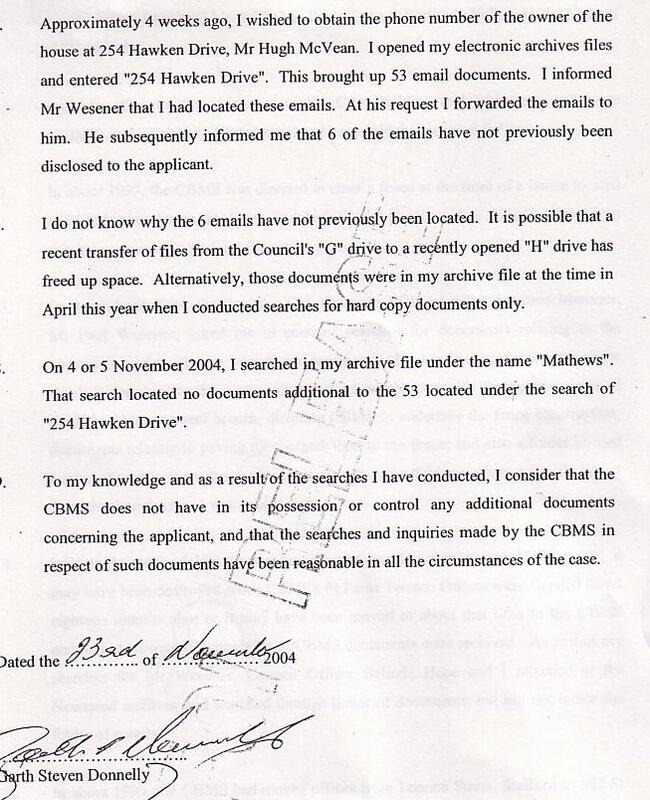 I made complaint to the CMC, who required an investigator be contracted by the BCC to investigate and lo and behold, he discovered emails that Garth Donnelly had deliberately with-held. 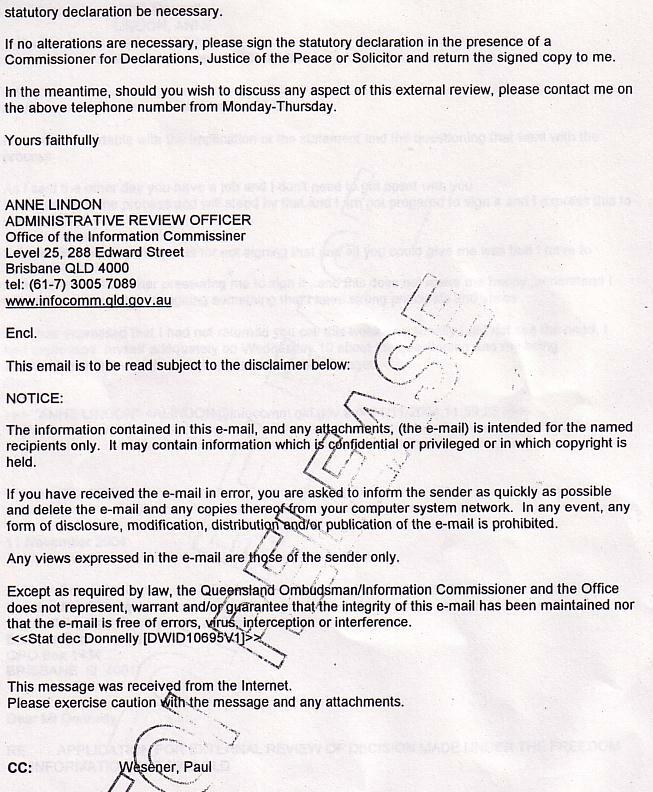 The investigate permitted Garth Donnelly to make a voluntary 'discovery' of them. This was after I had made complaint to the Office of the Information Commissioner, who investigated. Garth Donnelly was interviewed. He told lies of how he 'discovered' them. 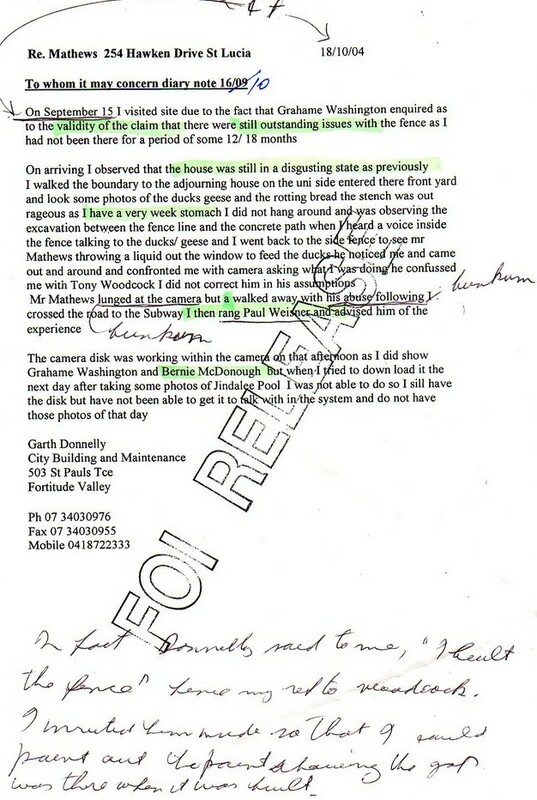 This is when the trouble really started for Garth Donnelly, because the OIC investigator committed those lies of Garth Donnelly to a Statutory Declaration and required Garth Donnelly to sign it. He protested, and I have the emails [plural] by FOI, where he was protesting that he did not want to sign it. However, he eventually did sing it. This IS PERJURY. I will publish this much now and further publish all the documentary evidence of the WHINGING OF GARTH STEVEN DONNELLY, prior to his committing PERJURY.